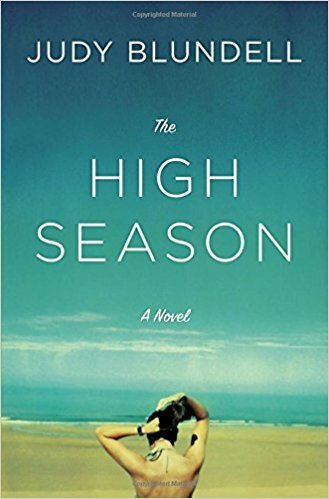 You can practically feel the sunlight pouring off the pages of The High Season, which, thanks to National Book Award Winner Judy Blundell's lyrical and painterly prose, is as picturesque as the summery Long Island beach house where the novel's action is set. Told from the points-of-view of multiple characters, the instantly compelling book introduces us to the local residents and seasonal visitors of a beautiful beach community that's big enough to enjoy but small enough that secrets don't stay that way for long as its inhabitants soon find out. Although it's made fiscal sense, renting their gorgeous home every summer in order to afford to live in it during the rest of the year has begun to wear on our main protagonist, museum director Ruthie Dutton and her fifteen-year-old daughter Jem. Renovating a perfect beach house only to need to leave it during its peak season has been a leading cause of the breakdown of her marriage to Mike, with whom she's still on excellent terms, and even though the mature Jem puts up a good front, Ruthie hates the idea of uprooting her each summer. And when her latest renter makes herself home a little too quickly – setting her sights on Mike, her friends, and possibly a permanent place in North Fork – Ruthie finds herself at war, especially after the renter's college aged stepson takes an interest in Jem, and nonprofit art world politics threaten her livelihood. Breaking down the action on several fronts, we're also introduced to Ruthie's enigmatic young coworker Doe who's perfected the art of blending in anywhere and with anyone and it's in Doe's chapters that Blundell and the reader has the most fun as she gently satirizes the rich. The first book the author has penned exclusively for adults, admittedly there are times when The High Season's older characters (especially Ruthie) act more immature than their younger counterparts do in incongruous scenes that hinders their relatability. A gifted stylist, however, Blundell doesn't lose us for long. As high stakes subplots begin to collide, the book rebounds from a slightly muddled middle act – delivering a final hundred pages you'll fly right through just as fast as this entertaining read flies off shelves this summer. Text ©2018, Film Intuition, LLC; All Rights Reserved. http://www.filmintuition.com Unauthorized Reproduction or Publication Elsewhere is Strictly Prohibited and in violation of the Digital Millennium Copyright Act. FTC Disclosure: Per standard professional practice, I received a review copy of this title through Bookish First in order to voluntarily decide to evaluate it for my readers, which had no impact whatsoever on whether or not it received a favorable or unfavorable critique.